There is a beautiful underlying statement to the ongoing Festa Della Sensa food festival at Bene, the Italian specialty at Sheraton Bangalore. For a country sandwiched between the Mediterranean in the south and the beautiful Alps in the north, it’s hard to not be influenced by your geographical identity in your cuisine. 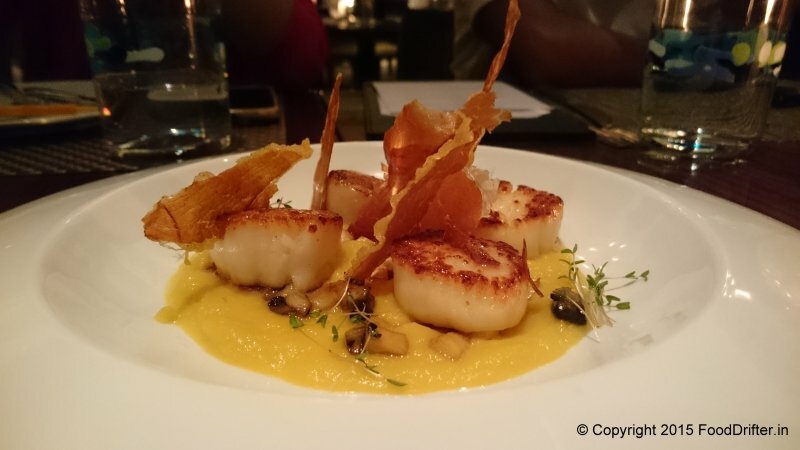 The menu which has been curated by Chef Guiseppe Lioce of Westin, Pune focuses on simplicity. Hearing the chef explain his intention of serving food which is close to his heart with greater focus on quality was invigorating. The terrace setting which had been laid out was beautiful overlooking a crystal clear calmness of blue. A sense of relaxed atmosphere you’ll want to lean back with a glass of wine in hand and be ready to experience Italian at it’s best. That’s the astounding feeling which overcame me as I stepped into Bene for the Festa Della Sensa. The original Festa Della Sensa festival at Venice also commemorates the Marriage of Sea Ceremony. Going back to his Italian roots, Chef Guiseppe had curated a menu which signified the marriage between land and sea. Little were we to expect as to how exquisitely every dish symbolized the elemental theme. Leaning back with a subtly prepared Mistletoe Mocktail in hand, I was ready for to be overcome with what the menu had in store. The menu was 6 course and the night began with an ingenious Amuse Bouche. The Pettole Pugliese was deep fried pizza dough flavored with Italian herbs, rosemary on a bed of Mediterranean Bell Pepper sauce. This Amuse Bouche in particular was an interactive session with the chef taking his time to explain the procedure to have this fine dish. Along with the plate, brought to us were the dropper injections with additional sauces. You are supposed to take a piece, dip it in the sauce in the plate take a bite and then immediately press the dropper inside your mouth (similarity to having tequila). The Antipasti had two each from Vegetarian and Non-vegetarian like most courses on the menu. Keeping the theme of menu in mind, most of the dishes on menu are largely a sea-food lover’s delight. The Carpaccio di Funghi which is thinly sliced mushroom marinated in lemons and Lavender vinaigrette was outstanding. It had a nice tangy taste to it and had been beautifully served on the plate, garnished with mint and shaved parmesan. It is an art and takes a delicate touch of a chef’s knife to thinly slice through Tuna to make the exquisite Carpaccio di Tonno. The Capesante Mare e Manti was such a thought-provoking dish in which each element on plate held importance. The scallops (representing the Mediterranean Sea), wild mushrooms (representing the Alps), pumpkin puree and Parma Ham (representing fertile Po Valley) was a delicate combination polished with truffle honey which came alive together on the plate. The Zuppas (soups) was delicate and played with intricate flavors in a bowl. The Zuppa di Pesce was a delight playing along with the complex flavors of the cockle shellfish, squid and prawns all cooked in a gob-smacking sea-food stock. For the vegetarians was the Zuppa Di Fagioli, a thick parmesan and cannellini bean based soup served with Focaccia bread. The next course of pastas had all been handcrafted charmingly with burst of simplistic flavors bursting with earthy undertones. Every dish in the main course were stand-outs. Hitting all the right notes was the Branzino Livornese, a delightfully cooked sea bass baked in tomato sauce, anchovies, and capers, topped with fried polenta and spinach. The Stracotto Di Agnello was the stand-out of the night. This North Italian preparation is boneless Australian lamb shanks slow cooked slow cooked for nearly 9 hours served with rosemary and red wine sauce. The meat was so succulent and fall of the bone and literally one of the best meat preparations I had in a long time. The last course for me was the most awaited with me being a desert-lover. The Millefoglie is the Chef’s take on the classic French Mille Feuille. It is a warm puff pastry served with Italian custard, blueberries and vanilla ice-cream. The other dessert on menu was the Pasticciotto, a warm Italian short bread filled with Italian custard, Nutella and goes very well with a spoon of the vanilla ice-cream served along-with. The Festa Della Sensa Italian food festival at Bene isn’t just about food. It’s about experiencing culture, true heritage and beliefs through food. The food festival is on from 15th -24th May, 2015. The entire set of photos from the Food Festival at Bene can be found here at Flickr.